This is a great set that can be used for so many different techniques. I used some Emboss Resist with my project and some Bright Distress Inks. 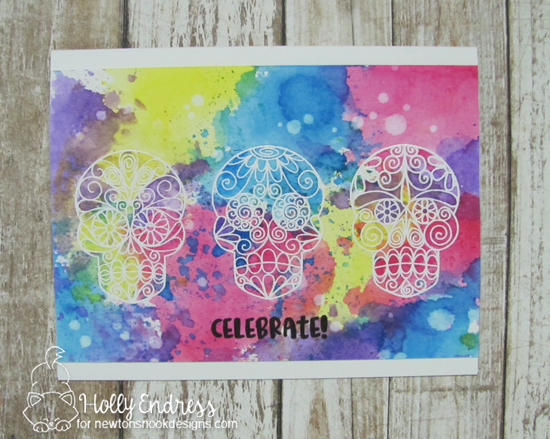 I heat embossed the skulls onto a piece of watercolor paper using White embossing powder. Then I added several shades of Distress inks using the Smooshing technique. After it was dry, I wiped the images off removing any excess ink and then I trimmed a 1/4" off each side and stamped the Celebrate sentiment from the Cocktail mixer set. I wanted to the colors to really pop so I adhered the panel to a White card base. Our Second set today is Spooky Skeletons.. this set also has a coordinating die. Eeeekkkk!!! How fun is this set? 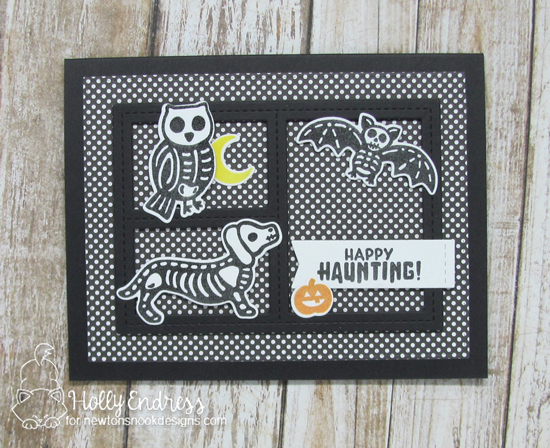 I created a Fun card using some Glow in the Dark embossing powder. It was a bit tricky to photograph the glowing. I created a Black card base and added some Pattern paper and a frame from Black cardstock as well. Then I stamped each of the images onto some White cardstock in VersaFine Black ink and coated them with the Glow in the Dark embossing powder and heat set them. I used the coordinating dies to cut them out and adhered them within the Frame. I stamped the pumpkin and the Moon in Orange and Yellow Pigment inks and heat set them using the same powder. I stamped the sentiment onto a piece of White card stock and used a banner die to cut it out. I adhered it over the frame with some foam tape. Here you can see it when the lights are out but it's not a very good picture. 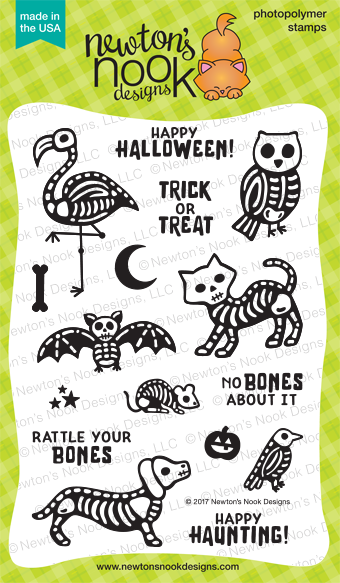 Would you like to win the “Spooky Skeletons or Beautiful Bones” Stamp Set? Comment on the NND blog and Design Team blogs (see list below)! The winner will be chosen at random from the collective reveal posts. Make sure to check out each of their blogs and comment for your chance to win. You will not know which blog has been chosen so the more you comment on the better your chances are of winning! You have until Thursday September 14th at 9pm CST to comment -- winners will be announced on the blog post on Friday, September 15th. Love the glow in the dark idea! Fun glow-in-the-dark details on your second card and the background on the first is really cool. Thanks for the inspiration. Great cards, love your colorful background! Love the skeleton stamp set. That polka dot background really works-I would not thot of that! Love these skellies! Halloween is my jam! Great job on the cards! Love! I LOVE that your adorable dog card glows! GReat cards! The beautiful bones set is my favorite. And I LOVE the glow in the dark card; genius. I can hardly believe it!! I've been using Newtons swirly leaves and dies all day and now these skulls!! They are a perfect match <3 I'm loving your cards esp the glow in the dark!! Kids are going to LOVE this!!! I love the glow in the dark element! So cute! Love the background for the skulls and the creative layout for your second card! 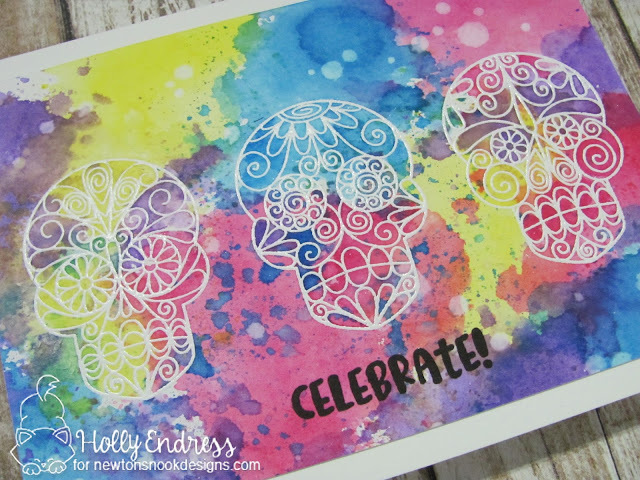 Pretty colors for your sugar skulls card, and such a fun Halloween card with the Spooky Skeletons set! Wonderful cards. That colourful background is stunning. Thanks for the inspiration. Loved your sugar skulls card. Great colors. The animal skeleton card is adorable. Love the glow in the dark embossing. Brilliant work, I love that colorful background of yours! Your card...it glows in the dark! So cool! Wow! Love the glow in the dark embossing powder technique! I've never seen that before! 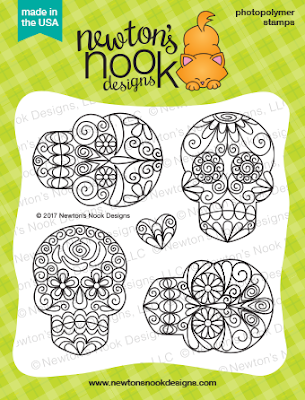 Perfect for Halloween projects! So much fun! Love your gorgeous Watercolor and how cool is the glow in the dark?! I absolutely love Spooky Skeletons. As a wiener dog mommy, this set is a must-have! Great job making a super cute card with it. 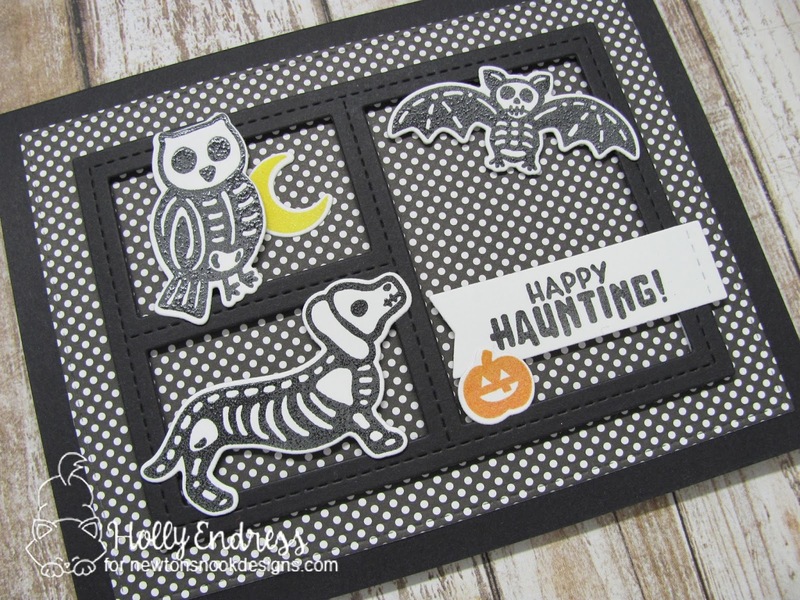 The glow in the dark embossing powder is fabulous! Beautiful background and lovely light up card!